Done-in-a-Day projects are organized volunteer efforts targeted at helping the community in just one day. 2018 – 2019 events are listed below. If you would like your organization to be considered for a future Junior League of Lawton project or volunteer event, check our criteria here. 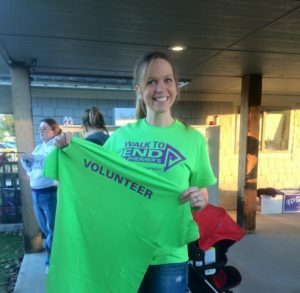 Junior League member Sarah Woods distributes T-shirts during the Walk to End Alzheimers 2015.